Felt Lab- 5 methods for cutting felt tested. Felt is a great crafting medium for at least a megaton of reasons one of which is the fabric fibers are tangled together and therefore they do not require seams to prevent fraying. This makes felt perfect for applique or detail pieces. Cutting simple felt shapes like squares, circles etc can be accomplished by simply holding the pattern near the center with the thumb while rotating the piece as you cut, but cutting smaller or detailed felt pattern pieces can be tricky. I have written about this before: Here But since this is something I literally do everyday I thought it could use a more through evaluation. Here are 5 well known methods (if you know of others I would love for you to let me know in the comments below) broken down and analyzed. These opinions are obviously my own and you may find other methods work better or worse for you. The felt cutting methods are, freezer paper, a commercial spray called No Pins, packing tape, chalk outline and actual pins. The felt used is a wool rayon blend in black. I am going to break this down into 5 categories and then let you know the overall winner and why. How hard is it to locate the product? Does this add additional cost or steps? Freezer Paper- Finding freezer paper sized to go through your printer can be difficult and printable freezer paper will NOT work with laser printers. It is however fairly easy to trace and draw on if you aren’t working off a printed pattern. Freezer paper in rolls is available in the bag and plastic wrap area of your local store. The rolled freezer paper is not the same as the sheets sold to go through printers, these sheets are too thin and curly and will jam up most printers even if you manage to cut it to the perfect size. You will also need an iron and an ironing board. No Pins- I ran across this brand spray, which is a temporary adhesive for paper patterns, in a quilting store. It works by spraying onto the back of a pattern, pressing it into place and ironing to set. I had never seen the product so I am not sure how easy it is to locate. You will also need an iron and an ironing board. Tape- You can use any clear tape but packing tape is my go to, the cheaper the better. I find I do have to clean my scissors blades after a long day of cutting. Packing tape is easy super easy to locate, easy to transport, inexpensive and always at the ready and can be used to cover nearly any size template. It does make that classic tape sound so if you plan to craft while waiting in the hall of your kids karate class be prepared for some odd looks. Trace – Typically you can trace with something much easier than chalk so the ease of use on a color other than black would be much better. I used a compressed chalk with a brush but tracing pens, chalk etc can be found at a craft store and may work better. Pins- Chances are you have some of these old standbys lying around. But if not they come in a variety of sizes and shapes and are pretty inexpensive they can usually even be located in the random house junk isle of the grocery store. They aren’t that easy to transport unless you have a needle book or pin cushion – otherwise one spill can make cleaning out your purse a real adventure. You also have to be careful where they end up which is less than ideal for you fellow couch crafters. WINNER TAPE – while tape and trace are both very portable, locating tape is much easier than any other item on this list. Can it be used anywhere? Do you need additional tools? How portable is this technique? Is it messy? Does it make trash? How easy is it to cut? Freezer Paper- You need an iron and ironing board so this is not the most portable method. The paper sticks to the felt making for very easy cleanup and creates minimal waste. Freezer paper is reuseable up to 6 times depending on the quality of your brand. And the freezer paper actually helps hold the felt stiff so cutting is SUPER easy. Nothing shifted and lines were easy to follow, the stiffness of the paper did make curves a bit more tricky to round. The paper can also lead you into a false sense of security with the size of your cuts, you may find they are too thin to hold together without the paper. No Pins- Oh boy! Protect your work surface! This is literally spray glue, you were warned. No matter who you are there will be over-spray and it will be gummy and sticky and you will wonder what has become of your life. 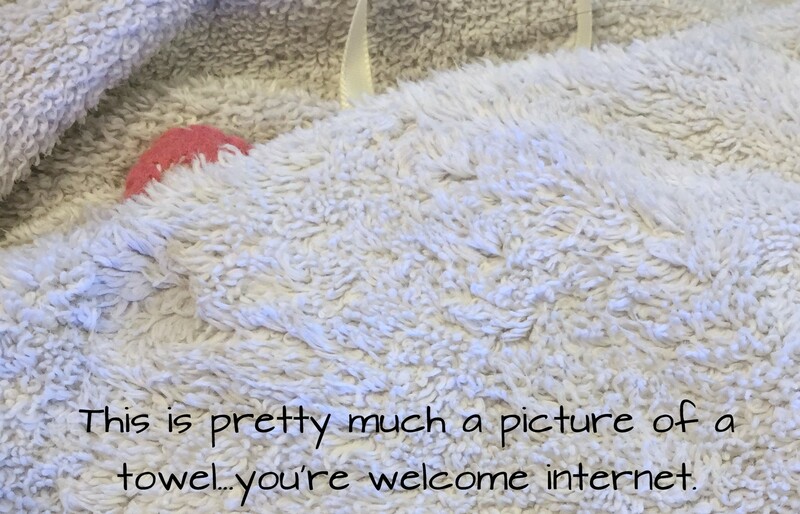 Surprisingly it stuck down very easily and ironing did not seem to be needed, but I am nothing if not a rule follower so I ironed for you dear reader. Dispite it being a lot of steps the pattern held firmly and was very easy to cut and easy to go back over in the areas I missed the first time. So while the attaching experience was a pain the cutting was actually quite easy and very easy to get the proper cuts. That being said it is NOT portable unless you pre- prepare your pieces, it is messy, and did I mention you have to iron? The pieces are said to be reusable but I haven’t tested. Tape- Take it with you! You can tape pieces down nearly any place. Getting it down could not be faster simply cut around your image (not exactly) and tape down. 5 seconds. It won’t move if you use classic packing tape, although it will shift as you cut and pieces start to fall away from the attached areas. Cut high detailed or small areas first to minimize any issues with shifting. The template will fall away after you cut it and the tape will have stiffened it making it reusuable and more sturdy. There will be some tape waste and you may need to clean your scissors with rubbing alchol to clear off any stickiness. My point being that this may not be a the best assessment of tracing. Cutting the template to outline was a pain, basically you have to cut your shape twice, with this method. The chalk went on easy and wasn’t nearly as messy as I assumed…until I cut it, then little flecks got on the scissors and I had to clean them off a few times during the cut. The cut was very accurate because I could clearly see my piece as I worked but this was offset by the flopping of the piece as I moved it around because unlike the other methods nothing was helping hold the felt taunt. The thin areas were much harder to cut without paper. The chalk didn’t hold detail as well as I would have liked and your ability to handle the piece is limited because the chalk will move. This method produced no trash and was very simple. Pins- Right away I learned placing the pins on these small pieces would be difficult. I had to move them around as I cut and any area not actually holding a pin moved away from the template. 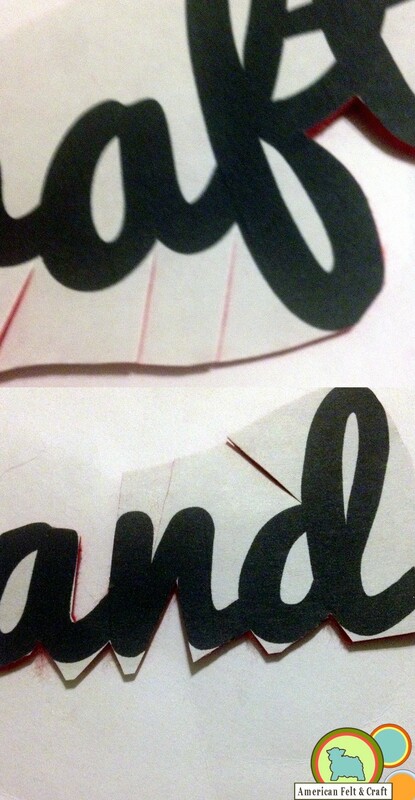 Details were extremely hard to cut because the template and the paper kept wanting to separate. The upside is there was no extra trash however you are limited on how much you could reuse the piece before the holes would make it unusable. You can pin anyplace without a lot of fuss so that’s an advantage. WINNER TAPE – Tape is my ride or die – simply because it is so easy and quick to work with, easy to locate, it’s cheap and works with any template. HONORABLE MENTION FREEZER PAPER – Freezer paper loses out big because of the need to iron BUT it brings up the rear with accuracy and ease to cut. Ironing pieces and setting them aside makes this a great portable option. Does it remove cleanly? Does it fray or pull the fibers, distort or tear the shape? Freezer Paper- Peels off perfectly. No residue, no distortion no tearing. Tape- Piece falls loose, no issues no distortion, no residue, The cut around the star was too thin and didn’t hold but the tape wasn’t at fault for that. Trace – No residue stayed in the fibers, no distortion, no tearing although I did have to dust off a few areas. Pins- No visible holes, no distortion, no tearing. WINNER FREEZER PAPER – Clean and easy release. HONORABLE MENTION TAPE – Tape also clean and easy but pulls away as you cut. Did it work, that seems pretty important. No Pins- The mess, the ironing, the distortion…hard pass. Trace – Results were pretty good. Pins- Results were pretty good. HONORABLE MENTION TAPE – Tape – oh how I love you packing tape. No Pins– Why would you want to? But can says yes. Packing Tape– Template yes, tape no. Tracing– No waste. Nothing to reuse. Packing Tape – Easy, low key and gets the job done. Tracing – I miss the sturdiness of the template. Floppy. No Pins – too many steps, makes the felt all fuzzy. What are your thoughts? What works well for you? Had any better luck with products like No Pins? Let me know in the comments. These cowrie shell inspired felt bracelets add a touch of the tropics to your child’s summer crafting. Easy to make these can be made start to finish by a beginning sewer with minimal effort. To make sure these beauties were totally doable for the tween crafter I enlisted the help of my 10 year old niece Ruby. And they turned out fabulously! 9″ x 1.5″ Bracelet felt color – Ruby used Chocolate, Lavender, and Embossed felt. 6″ x 6″ Off white felt/ shell color, she used Linen. Loosely cut around the bracelet template and try on to get it close to the right size. It will need to overlap so the button works. Trim the template and tape or pin it down to the felt and cut out. Cut out 4 shell shapes per bracelet cut the edges of these shapes with pinking shears, scallop scissors or just cut small triangles out along the edges with regular scissors. Mark where the button should go and sew down with criss crossing stitches. Mark the correct spot for the button-hole and carefully fold over the felt and cut. Cut less than you need to, you can always make it bigger. When you’re done your bracelet should button up! Lay down the shell shapes and sew along the middles with a simple running stitch. To make the shells curl place small dots of felt glue fold over and clip clothes pins to hold them until dry…about 15 minutes. Then remove the clips and rock those babies! 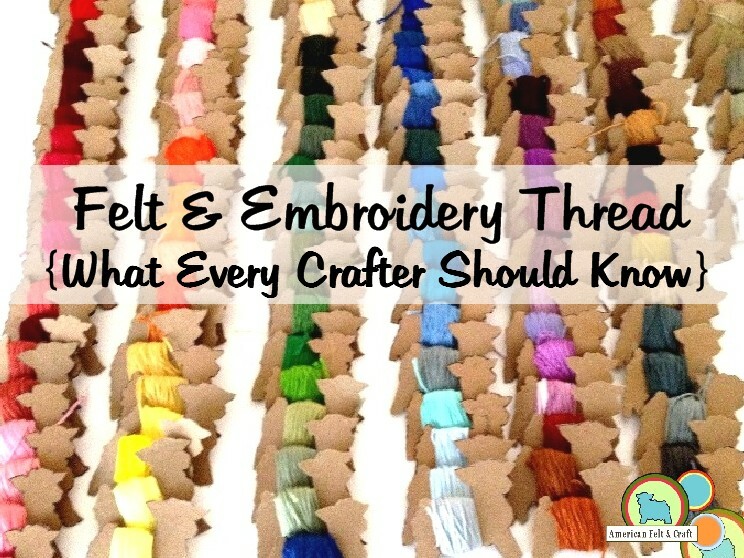 So you’ve made all these wonderful felt things but you just don’t know how to store felt crafts, ornaments, or heirloom pieces in the best, safest way possible you say? Have no fear, AFC is here. All in all felt is a great material to work with because a good quality wool or wool blend is pretty durable as fabrics go. But there is a right and a wrong way to store felt long-term. This is the best way to store wool and wool blend felt but the principles will work for any fabric materials. Light can fade felt’s colors and deteriorate it over time. 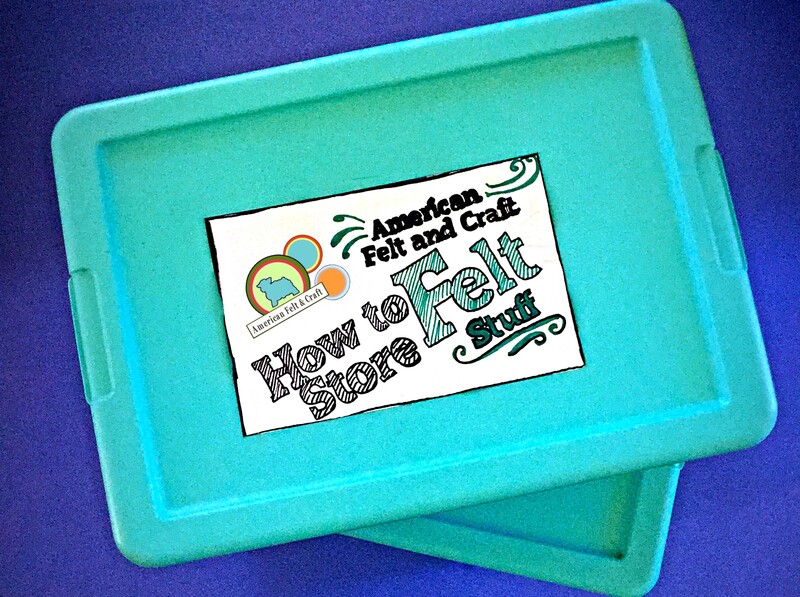 It’s best to store your felt pieces in plastic airtight containers. Clear containers work well too and will allow you to better see the contents. However if you plan to store your pieces anyplace that may be exposed to sunlight regularly store in a solid color plastic container or place the items into other light barriers such as a shoe box or acid free tissue paper before packing. Luckily wool has antimicrobial properties which resist mold and mildew naturally so you needn’t worry too much about those as a threat however moisture can weaken felt over time not to mention create a mess. To avoid problems make sure each piece is completely dry before packing it up. Avoid storing in cardboard alone, near garage doors or low to the ground. Throw in a few of those silica packets that come with shoes if you happen to have any handy. If not please feel free to see this as an excuse to go buy those new boots! I’m extremely pro shoes. It’s true moths love wool and other natural fibers. They also love peace and quiet like your basement. 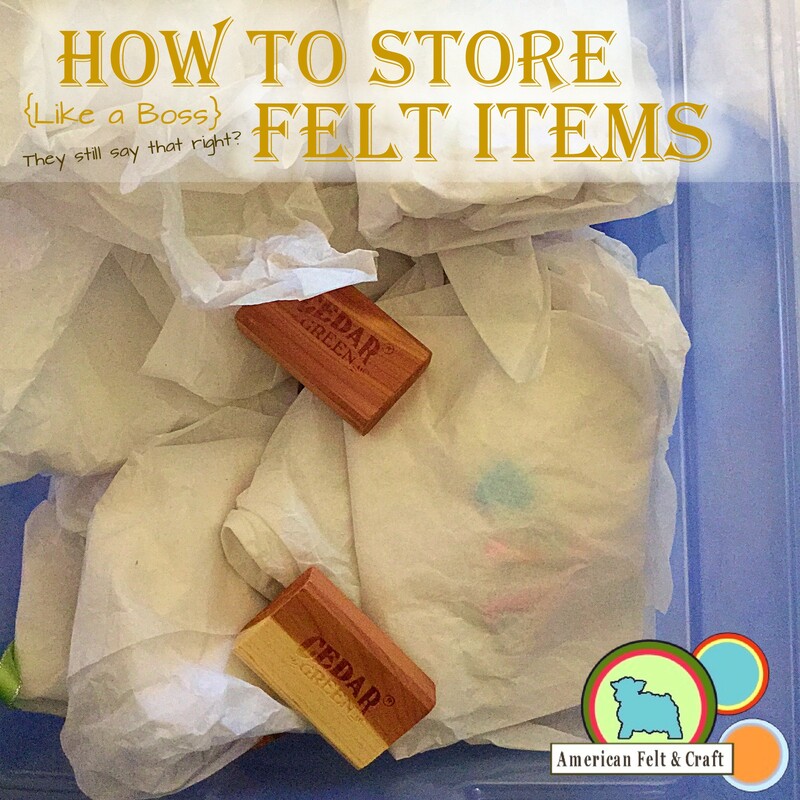 Keeping your felt pieces safe from months is actually pretty easy. Avoid any nasty run ins by storing in an airtight plastic container and making sure your felt pieces are cleaned of any food or debris that might be left on them. Not only do crumbs attract pests, the oils can discolor your pieces over time. If you are bringing in vintage pieces consider placing them in a zip lock baggie and freezing them for a few days, this will kill any stowaways and keep the rest of your collection safe. 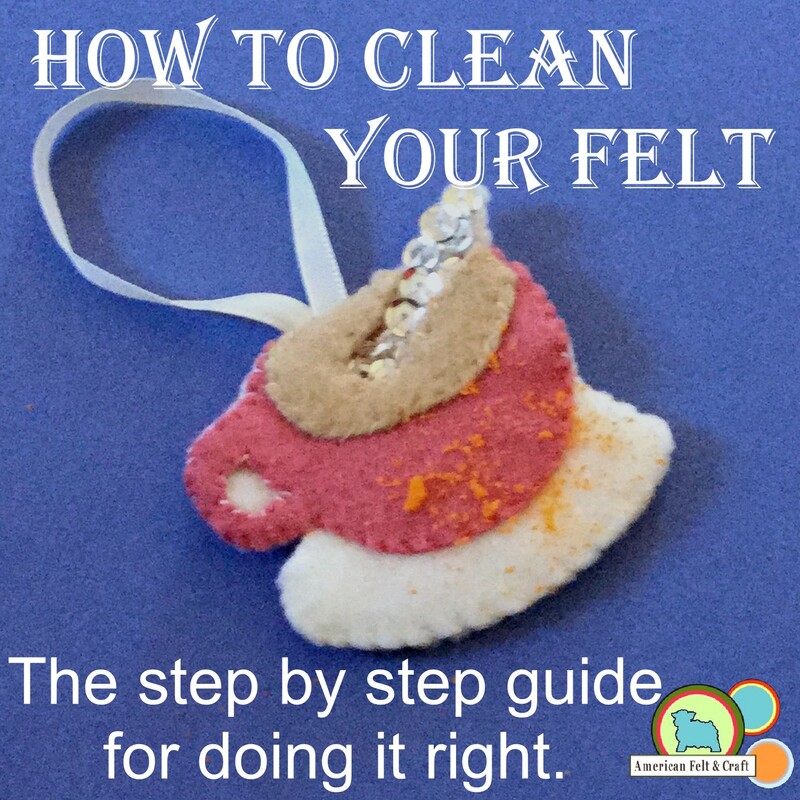 Here’s a quick run down for cleaning your felt pieces before storage. DON’T PANIC! 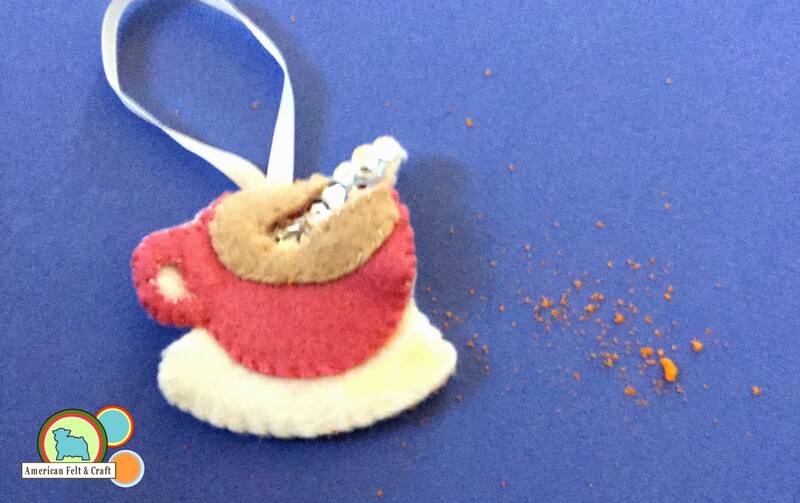 Dust away and loose crumbs gently. You’ll want to avoid grinding anything into the fibers. Flick the piece from the back if possible to help knock out any loose crumbs in the fibers. I ground this cracker in a bit for emphasis.Keep in mind that even if the piece appears clean you want to make sure no food particles remain or you may have a nasty surprise next year with set in stains and possible pest damage. Mix 1 part white vinegar or lemon juice to 2 parts water and gently dab at the remaining greasy spots. This will help break up the oils and get rid of any odor that might attract pests. Still have issues? That’s alright dear all the best people do. 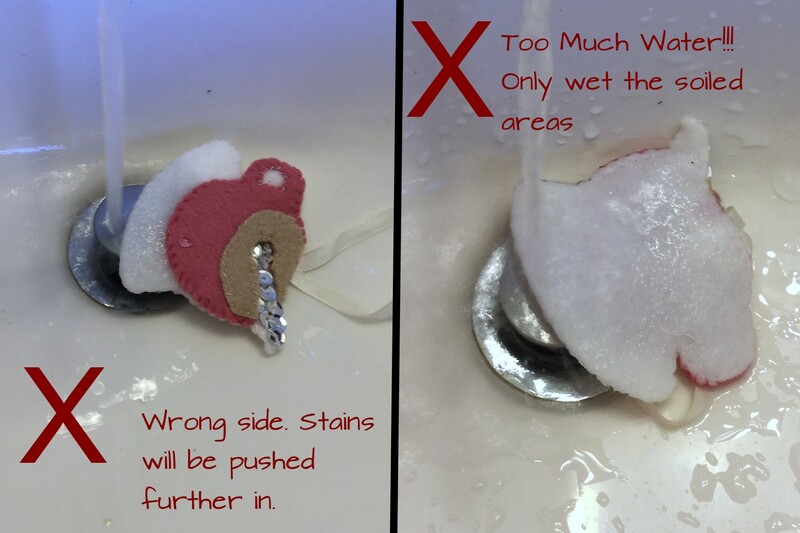 Take your piece to the sink and run room temperature water through the side opposite your stain. The flowing water will help dislodge any crumbs or oils. 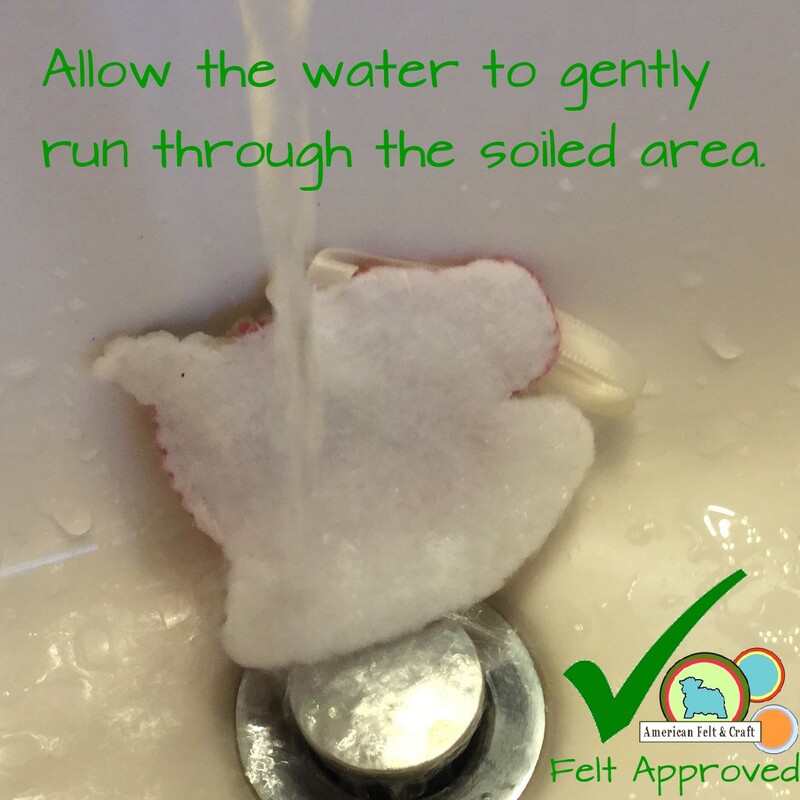 Hot water may hurt your wool and cold water will make it hard for the oil to dislodge. Try not to saturate any more of your piece than you have to. Some dyes may run and wet felt is weaker which isn’t great for vintage pieces. Don’t soak the piece just let the water run through for a minute. 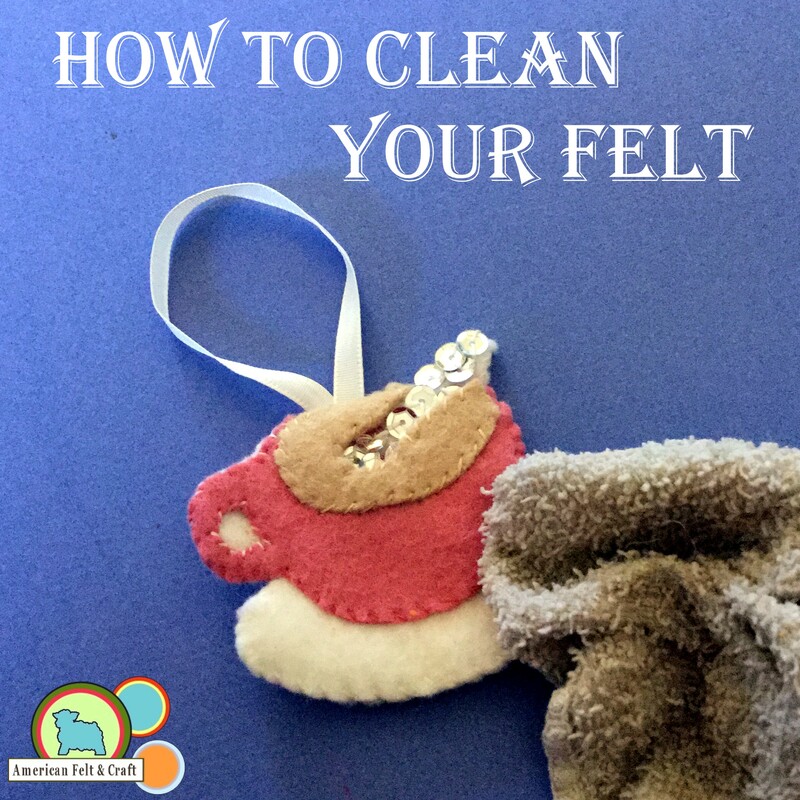 Pop that newly clean felt item in a clean towel and gently press out as much of the moisture as possible. DO NOT RUB!! Your felt is in a delicate place right now and rubbing it may cause it to pill. Examine your piece for any remaining stain. If it looks good place in a sunny place until just dry the UV rays will also help kill any lingering smell. If your piece is still in need of love repeat the vinegar – water – blot process until it is ready for storage. Double down on your pest prevention by doing a thorough cleaning of your storage area this will be sure to clear out any hidden enemies and make the space less attractive to traveling moths. Mothballs are a neurotoxin and smell horrible!!! Stick to cedar wood pieces or lavender for a natural repellent that won’t gag you come next Christmas AND your brain won’t be full of poisons! Win win! Make sure you replace the repellent every year since the natural oils in these items are what repel pests and they dissipate over time. Flat ornaments can easily be wrapped in acid free tissue paper this allows enough of a buffer so that beads and sequins remain undisturbed and the paper should keep everything nice and dry. 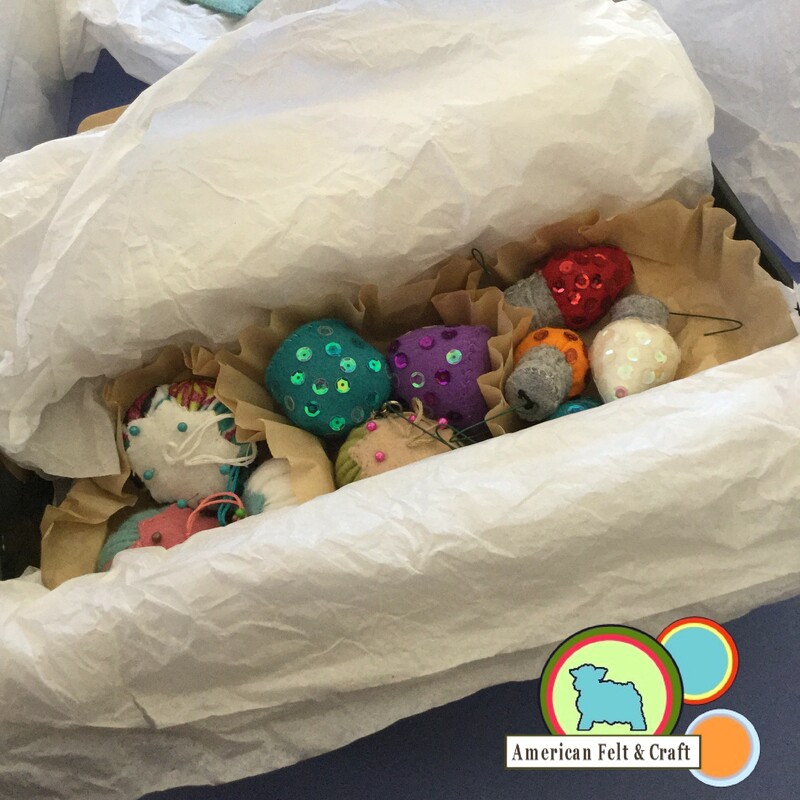 Dimensional felt ornaments can be kept in coffee filters or clean egg crates with some tissue paper to reduce any motion damage and keep sets together. Try to store pieces flat avoid folding to save the need for a low iron later. If you must fold because you are storing a large felt piece such as a tree skirt be sure to place acid free tissue paper between the felt to give the piece space to breathe and avoid any chance of colors running if exposed to moisture. 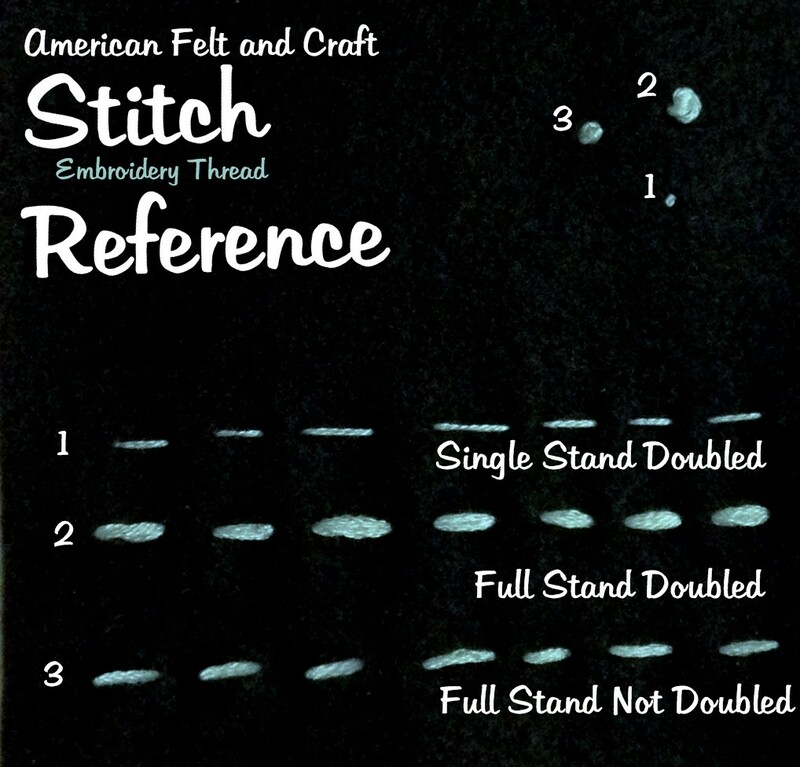 And there you have it – follow those simple steps and your felt pieces will be around for generations to come. 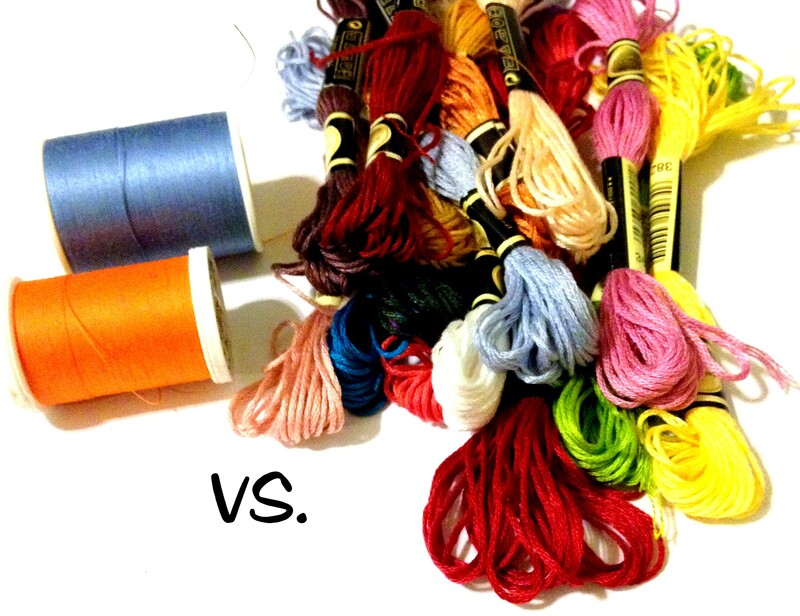 There are a ton of advantages to using embroidery thread for felt projects – not only are the skeins of thread inexpensive but they come in a huge variety of colors and are easy to store. The biggest problem with embroidery is its tendency to get tangled once they are stripped of their paper cuffs. 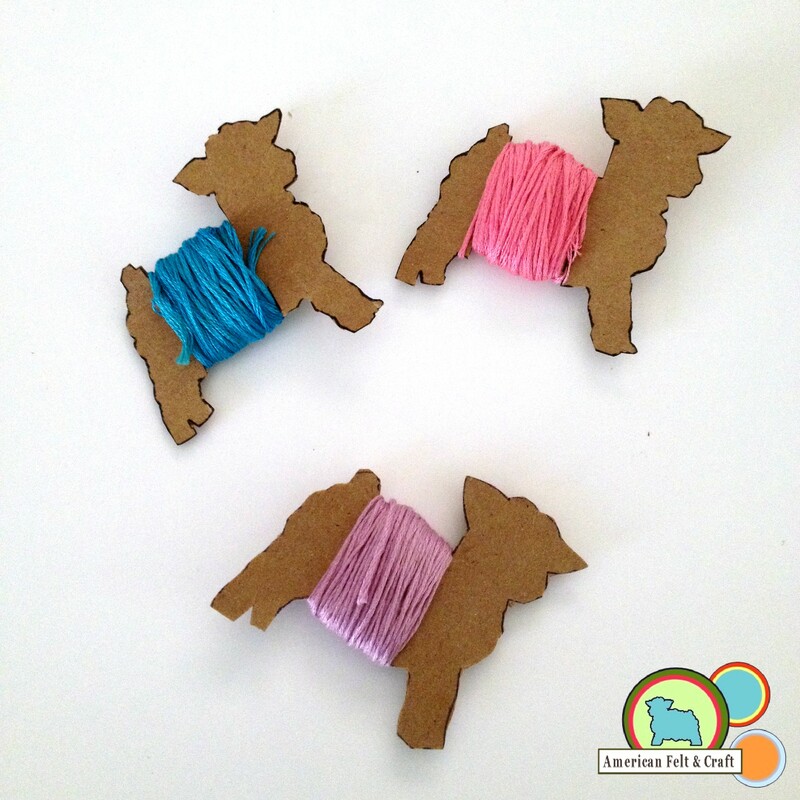 Rein in your threads Bo Peep style with these printable felt sheep bobbins. I tried printing these on cardstock but found it too flimsy for the larger skeins. Thin chipboard proved to be the perfect material for this project and I think the natural brown color looks awesome on these little guys. I won’t lie to you dear reader these a pain to cut out but hopefully you need less than I did. But come on they are crazy cute right and over 100 sheep later I have no regrets! While we’re on the subject here’s how to move that thread from skein to bobbin without finding yourself surrounded by tangled threads and tears…not that that happened to me like 25 times or anything. Slip one cuff off at a time taking care not to distort or twist the thread too much. Keep the thread in its circle and look for the shortest thread along the top. It should come apart smoothly. Printable freezer paper also called quilters paper solves these problems and makes it a breeze to use up those smaller felt scraps. Quilter’s freezer paper also adds a rigidity that makes it easy to accurately cut small or complex shapes from amazingly small pieces of felt. You’ll find it’s a life saver when mass producing felt items like party favors or making a felt flower bouquet. All without damaging or staining your felt. 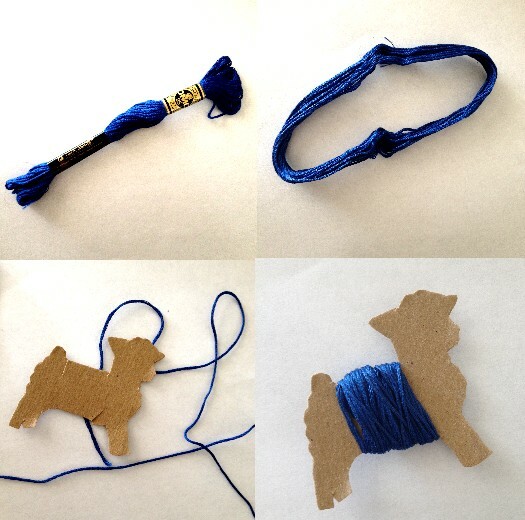 You might also want to check out Andie’s method for cutting small and detailed shapes without freezer paper for small projects. Freezer paper is not the same as parchment, butcher, or waxed paper. 1: You will have to cut the paper into printer sized sheets and given the thinness and curl even with precision they may still jam. 2: Since these pieces will be handled a lot while you are cutting them out the curl of rolled freezer paper can cause the paper to dislodge more easily grocery store versions also adhere less strongly so you may find yourself getting very frustrated especially if you want to reuse the templates or cut intricate shapes. Use the right tool for the job you won’t regret it. Plan out your templates in your favorite photo editing program. One sheet can be use on multiple colors so pack them in tightly and use every scrap of freezer paper. No need to reverse letters or shapes print your templates exactly the way you want your felt pieces to look. When choosing a font or a shape look for thick lines- the thicker the better. . Felt less than 1/4″ thick can and will tear. Print onto the matte (feels like regular paper) side NOT the shiny side. Cut your templates loose before ironing them onto to felt this makes it easier to position pieces and make the most of your felt. Letters can be broken up to fit onto your felt scraps. Freezer paper will stick to acrylic felt however it may not adhere firmly enough for open centered letters; the synthetic setting on the iron doesn’t fully melt the freezer paper backing. Bamboo felt is very soft and it may be difficult to remove the freezer sheets once ironed on. Wool or wool blend felt works best. Once your templates have printed cut away extra paper around shapes or letters, removing bulk first keeps your cuts accurate. Start slowly and cut inward you can always cut more but you can never cut less! Consider using smaller scissors for tight spaces. If you cut your words straight you can easily curve them after they are cut which also helps save felt. When cutting a layered piece it helps to print in color, no need to print each template piece separately! Iron shape to first color, cut out felt and peel off. Cut away the color you just completed and proceed to the next color. Quality freezer paper sheets can be reused again and again for each color. Each time it will adhere a little less firmly but I was able to use each piece up to 6 times. Interested in more freezer paper/ felt magic? Check out our DIY printed felt sheet tutorial or stop by the store! If you like it then you should put a pin on it! We ❤ Pinterest!